Last five articles in this series covered key macroeconomic indicators relating to national production, labour market, fiscal sector, foreign sector and financial sector and what they reflect on economic development of the country since 1950s. This article outlines key indicators representative of the distributional disparities of economic development across the public. The most of macroeconomic indicators reflect overall trends of the economy. Their interpretations also are diverse and controversial. Therefore, they do not show whether the economic development has been generated by or distributed among various sectors/segments of the economy with greater equality so that living standards of the wider public is improved while economic disparities are reduced. Such distributional disparities are generally identified for production in sectors and geographical regions, household/personal income, social gaps in economic activities and household living conditions. The lack of time series data is the key problem in analyzing the trends of these disparities relative to overall macroeconomic trends. As most data come from different household surveys and ad-hoc data sources that are subject to concerns and controversies. Few important distributions are outlined below. Some complain that Sri Lanka is primarily an agriculture economy due to fertile land and historic irrigation system and, therefore, agriculture should be developed to be the lead sector in national production/GDP. Meanwhile, some argue for expansion of industries to promote value-added exports and generate more employment. Such analyses are based on how the country’s production stricture should be distributed among agriculture, industry and services. The contribution of the agriculture sector to the GDP in Sri Lanka has declined from 44% in 1950s to 8% in 2010s (Table 1). In opposite, industry and service sectors have grown faster with the service sector becoming dominant at 56% in GDP. This sectoral GDP distribution is a diversely interpreted subject. Some argue that agriculture sector has almost collapsed and this kind of national development is not sustainable. However, agriculture production also has increased in record volumes due to new irrigation facilities and new cultivation techniques although its share in the GDP has declined. Further, in open economy, the country’s development has been broad-based faster to other sectors. The service sector has grown mainly on supply of services to foreign countries and development of trade in the new economy. In GDP estimates, agriculture includes only the value-addition of cultivation/growing activity. The value of manufacturing on agricultural crops and services provided to cultivation activities is included in industry and service sectors. Therefore, agriculture sector and agriculture-based economy are two different concepts. There are many industrialized countries being agriculture-based economies. If agriculture-based activities that are included in industry and service sectors are estimated, Sri Lanka would be an agriculture-based economy. The promotion of industries and services can promote more employment and exports in open economies. Therefore, sectoral disparities in GDP should be carefully interpreted along with supporting data on generation of income and employment. Regional production disparities such as provinces, districts and rural and urban also are discussed. In general, economic activities are concentrated in areas/locations that provide convenient access to factors of production and trade. Therefore, forced locations of certain economic activities/industries/investment promotion zones with targets of providing employment to people around those locations will not always be successful unless they are good industrial locations in production theory. Therefore, the view of balanced regional development could be a costly approach unless the supply/ value chain is accessible. Concerns over income inequality among households/persons are raised world over, despite different stages of development. Political leaders representing low income segments are concerned about income inequality as they believe that benefits of the economic development are not broad-based unless the inequality is reduced through policy initiatives. Information shows that income of the lower income groups has not improved relative to higher income groups. For example, the income share of the bottom 10% income category has remained around 1.5% or lower of total income in the past (Table 2). Meanwhile, the income share of middle-income groups has improved noticeably while it reduced in high income brackets, e.g., from 42% to 35% in the top 10% income category. However, the overall income inequality as measured by Gini ratio (i.e., 0 if income is equally distributed among all and 1 if all income goes to one person) has almost remained around the middle level. Information of Census and Statistics Dept. shows a reduction in inequality from 0.55 in 2006 to 0.51 in 2016. Income inequality is a complex outcome which largely depends on the inequality of skills, productive resources and competitiveness among persons/households, given the state economic management system. Therefore, views to eliminate the income inequality in full are not practical. What is necessary is to have a policy mix to enable people of different abilities and skills to get the access to production activities so that their living standards get parallelly improved along with economic development. The level of unemployment across various segments shows disparities in employment opportunities arising from development. In Sri Lanka, unemployment rate has been noticeably higher among females, youth and educated persons (Table 3). Although unemployment rates have considerably declined in the past, such disparities have continued or increased. This shows greater disparity of benefits of economic development distributed among the public. If the economic development is fairly distributed, the quality of living in the household sector will improve with access to better household amenities and consumption beyond basic food. 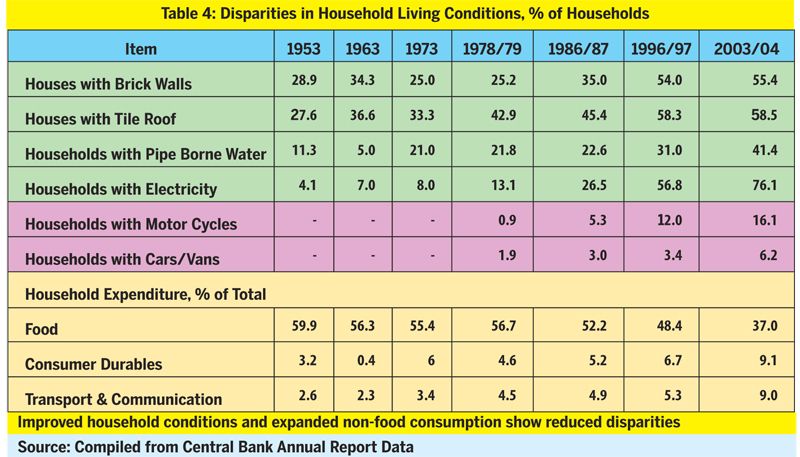 Information gathered from household surveys shows major improvements in housing conditions, broad-basing consumption expenditure from food to consumer durables, transport and communication (Table 4). The reduction of food expenditure from 61% in 1990 to 35% in 2016 is an indication of improved quality of living through wider non-food consumption due to rising income and development. The rising usage of motor vehicles, information communication instruments, health and education services and construction of houses and apartments are strong evidence for the rising quality of living although there can be significant quality disparities among households/people. None can expect the equality in quality of living. Ad-hoc tax policies that prevent low income segments moving to better quality consumption levels, e.g., higher tariff and credit restrictions on small cars, are not favorable. The present consumption trends are eye-witnesses for maturity in consumption, despite the differences in quality. Large volumes of imports and sales of electrical goods, smart phones, computers, motor vehicles are evidence for consumption of modern technology, but at different quality levels. Growing real estate business, housing schemes and housing credit facilities are evidence for improved housing in the country. The number of households without electricity and water at present should be at historically low levels. Such improved quality of living standards relative to lower growth of real income shows considerable underestimation of GDP estimates. Wide disparities in utilization of income among consumption and savings have macroeconomic consequences (Table 1). Although savings have increased from 13% of GDP to 25%, the insufficiency of domestic savings to finance investments is seen as a constraint on the development. 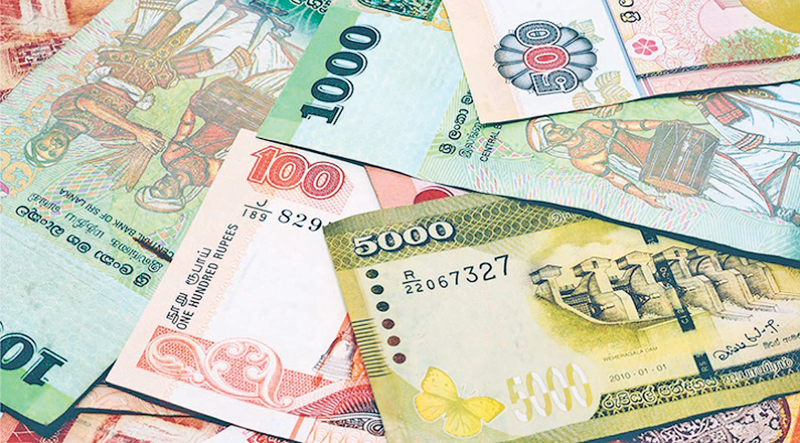 Although the economic growth can be driven by foreign investments, Sri Lanka’s competitiveness to attract foreign investments has been poor due to domestic factors and has restricted the fast development relative to peer countries. The level of income, credit system and stability in interest rates and inflation determine the distribution of income between consumption, savings and investments. The present capitalist system that dominates economics and economies world over goes by the competition and believes in economic benefits being trickled down to wider sectors of the economy based on talents, skills and trade and, therefore, does not worry about distribution side of the development or economic disparities. Therefore, if country authorities are not satisfied with the present distributional outcomes, it is their duty to implement a macroeconomic policy mix for preferred or measured distributional outcomes. People have the constitutional rights to see that the state ensures that the operation of the economic system does not result in the concentration of wealth and means of production to the common detriment and that the state eliminates economic and social privilege and disparity and the exploitation of man by man and by the state. This requires conscious policies to ensure the availability of systems to promote greater distribution of economic resources and benefits among the public in various locations and social groups. Civil conflicts that destroy economic development from time to time arise from grave concerns over wide distributional disparities. The young are most prone to such conflicts as the level of distribution of economic opportunities and benefits among them is especially questioned. In that respect, the new line Ministry for Public Distribution is considered desirable to focus macroeconomic policies on reducing major disparities that are not desirable. What is necessary is to fine-tune the capitalism to achieve certain distributional targets along with overall macroeconomic targets. For example, China after 40 years (1978-2018) of economic reform and liberalization and national progress in the global economy is now in the process of implementing a set of policies for elimination of targeted poverty from identified groups that was not helped by the new economy. Everybody knows broad areas of policies. First is the fiscal policy to have a mix of expenditures, subsidies and taxes to focus on improvement in distribution of production, employment and income. Second is the monetary and financial policy to improve the distribution of access to credit/money at affordable terms with varying degree of business risks that can reduce disparities in mobilization of productive resources, production, employment and income. Therefore, the government may now review the present status of economic distribution outcomes based on a reliable set of data. If the government is not satisfied with the present progress, it has to prepare a time-bound policy plan for macroeconomic targets along with distributional targets in respect of identified disparities to broad-base the economic activities and their benefits in next one to two decades. The protection provided by the state through various subsidies and regulations (such as minimum wages and working hours) to less privileged/poorer segments is a part of policy measures to address economic disparities. No government can improve the distribution side of the economy in one or two years. If it is not feasible, the best option is to facilitate the capitalism and markets to handle distributional disparities too without causing bureaucratic red tapes that would worsen the present progress. What is required is the elevation of the quality of living of all segments of the public along with the development and not the reduction of disparities per se which much more complex and confused. Since disparities are based on comparisons, the non-availability of benchmarks is a major problem confronted in analyzing distributional disparities. Or, you could stop using economies, ownership, price tagging, servitude... like all the other non-capitalist living things on the planet. I am quite agree with ideas presented and Sri Lanka still considers that economic development and growth are reflected in volume of GDP and the pace of growth. The most important aspect is reducing or elimination of disparies.